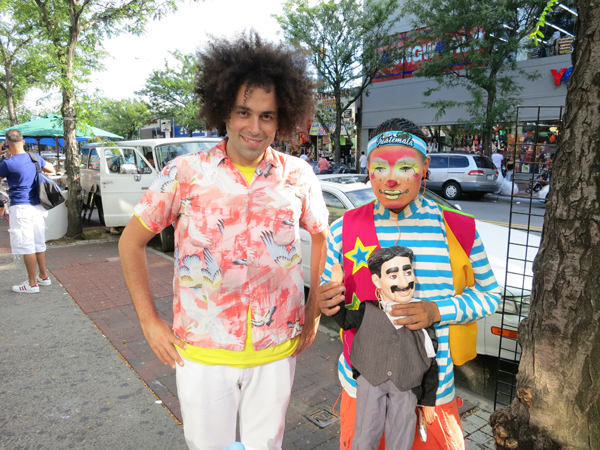 This is Tontyn, a clown I met on Junction Blvd. in Corona, Queens. 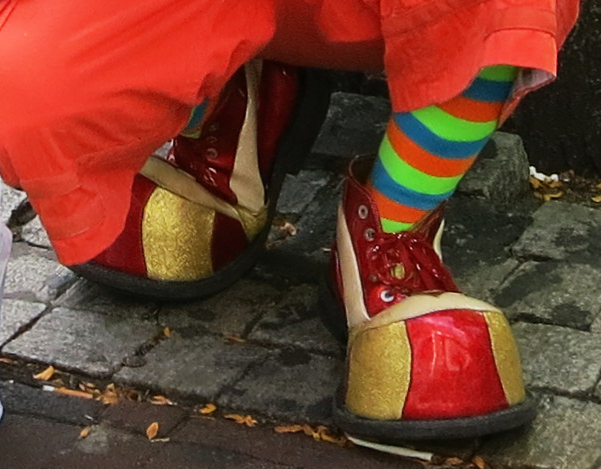 Tontyn is for hire, but he also does a lot of charity work, with his crew, The Payasitos, which means, The Clowns. or the blue tint cornrows. I think it's pretty good, but it's scary. Groucho says hi, even though it looks like Tontyn's checking for a pulse. Christian Louboutin high heels, but every bit as insane. 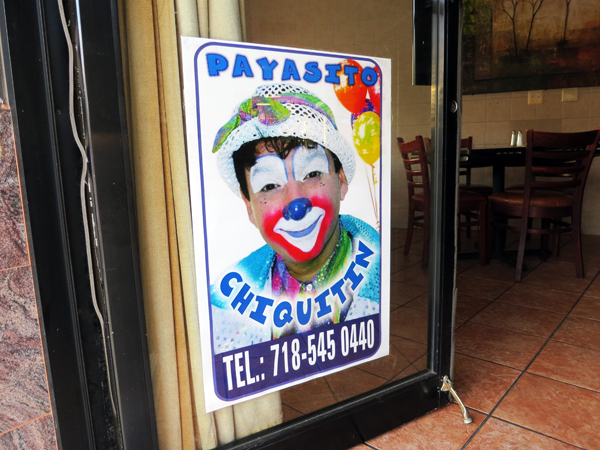 Possibly the most interesting thing about Tontyn's story was that he told me that there is ANOTHER crew of clowns who work the Jackson Heights area of Queens, but recently have started to perform on The Payasitos turf. 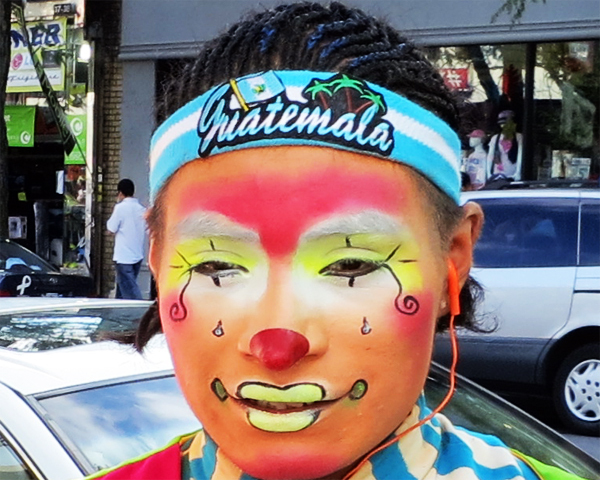 Tontyn said that the other clown crew ALSO calls themselves The Payasitos, so Tontyn's Payasitos have begun to call themselves The Payasitos Reales, or, The Real Clowns. When I pressed him, Tontyn told me that, yes, there has been some heat related to the turf war, most notable was when the Real Clowns caught Chiquitin, the self-declared leader of the other Clowns doing a princess-themed b-day party in a Pizzeria on 98th Street. You might think they beat him up, but Tontyn said all they did was smear his make-up, AFTER THE SHOW, so the kids wouldn't be upset. The Real Clowns now call their enemies, "Los Payasos Sin Talinto", or, the Untalented Clowns. Granted, Tontyn's English was pretty banged up, and my Spanish is far worse, especially when trying to decipher Tontyn's strange clowny Guatemalan Spanish, so my facts might not be 100% on the money. A poster for Chiquitin that I saw later that day in the door of a taqueria on Astoria Blvd. 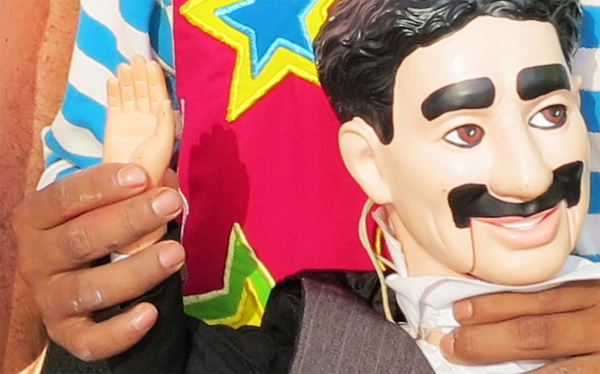 Chiquitin is the leader of Los Payasos Sin Talinto. Frankie's doing what Bruce Davidson did in the 50s in Brooklyn.